If you’re overcome with fears and insecurities, you do not see any purpose in your life and do not know what to strive for, you have constant problems with people close to you and you feel as if no-one understands you, then our psychologist Natalia might help you see new opportunities and change the things in your life that prevent you from being cheerful and achieving your goals. You can talk to Natalia individually, or take part in a group where you will hear what other people are going through and can find answers to your questions. The atmosphere in these group sessions is quite friendly and pleasant, and if you lack simple human communication and are tired of loneliness, then this is what you need. You can get useful advice or share your experience, and Natalia will provide you with the tools that will help you achieve your goals. Group and individual counseling services are provided in three cities: Narva, Jõhvi, and Tallinn. Residents of other Estonian cities can receive individual psychological counseling online. You can register for individual or group consultations by phone: (+372) 56224076, or by e-mail: natalia.rediskina@gmail.com. The service is free and confidential! In Estonia, the number of new HIV infections is increasing every day. More and more people are asking questions like “How to live with this?”, “What will it change in my life?”, “Can I live a fulfilling life?”, “Should I talk about my HIV status to my relatives? My employer? The doctors?”, “When do I start the treatment?”, “Can I give birth to a healthy child?”, “How to help a loved one?”, “Is it true that the side effects of the treatment are unbearable?”, “Is HIV transmitted through a mosquito bite?”, “Is it true that HIV is part of a global conspiracy?”, etc. For this purpose, our organization has created a peer-to-peer consultation service, with experienced consultants providing answers to all of your most urgent questions, and, most importantly, will deliver reliable information to you, share their experience, help establish contact with the doctor, and understand what’s what. Myths and prejudices should be ignored; the most important thing is to take care of one’s health, while also improving the quality of one’s life. The peer counseling service includes individual both group counseling as well as support services. Our consultants give advice on all issues related to HIV, its treatment, drug addiction, hepatitis, and tuberculosis, and also provide support for family planning in cases where one or both of the partners are HIV-positive. In Tallinn, the consulting room is open from Monday to Friday from 10 a.m. to 5 p.m. at Rävala pst 8-1014, 10th floor. The peer consultant Caty consults in both Russian as well as Estonian. Contact: (+372) 56316013, caty@ehpv.ee. In Jõhvi, the consultation room is open from Monday to Friday from 10 a.m. to 5 p.m. at Keskväljak 8a. Contacts: Consultant Elena (+372) 53317025, jelena.antonova@ehpv.ee; Consultant Nadezhda: (+372) 56753737, n.kuznetsova@ehpv.ee; Consultant Ekaterina: (+372) 56240559, jekaterina.panitseva@ehpv.ee. In Narva, the consultation room is open from Monday to Friday from 10 a.m. to 5 p.m. at Linda 4, 6th floor. Contacts: Consultant Tatyana (+372) 53004074, tatyana@ehpv.ee; Consultant Maria: (+372) 53334226, maria.volkova@ehpv.ee. We live in a time when there are many opportunities, but we often do not know where to find them and what to do with them. A social worker helps people to orient themselves in our turbulent time and find the best solutions in the implementation of their ideas and abilities. advice on rights and responsibilities. 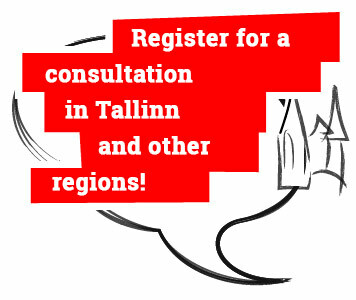 You can apply for online consultation by phone: (+372) 55578131, or by e-mail: jekaterina.smirnova@ehpv.ee. If necessary, our social worker can redirect you to other specialists. Not many people want to spend their whole lives alone. In order to achieve a complete personal universe here on Earth, a human being’s entire inner world seeks for another human being. Having firsthand experience with the nature of the problems faced by HIV-positive people on their way to creating such private domains, we decided on our part to pay special attention to family relations and offer diverse support for couples where one or both of the partners are living with HIV. To do this, our team is ready to help you in gaining inner strength and freedom for making the right decisions, and making you and your loved ones happy. We will be glad to support, inspire and slightly admonish you along the way! Please call: (+372) 56224076 (Natalia) or e-mail: natalia.rediskina@gmail.com. Support is provided free of charge, taking into account all measures of confidentiality and anonymity. The team employs specialists qualified in psychological and social issues, as well as in topics related to HIV infection. If your child needs help with studying, drawing, learning letters and numbers, reading and communicating, then call our consultant Tatyana: (+372) 53004074; tatyana@ehpv.ee. We offer free, individual support to children in acquiring knowledge of the world. We are located at Linda 4, Narva. For several years the organization has established close cooperation with the Unemployment Insurance Fund (Töötukassa). If you are registered as unemployed at the Fund and have a desire to join our team, learn something new, bring your individuality and ideas into our daily work, and share your unique experience, then you have the opportunity to participate in work training or become a volunteer with the organization. Details on the terms and scholarships can be found on the website: www.tootukassa.ee.